The origins of San Marino are based on the charming legend of Saint Marinus, who founded the community and the republic in AD301 after taking refuge on Mount Titano. The independence of San Marino was enshrined after Italian Unification, possibly in gratitude for at one time harbouring Garibaldi, the great leader of the Risorgimento. Apart from the Vatican City, it is the only city-state that is completely surrounded by another country. In whatever part of this 61 sq km (24 sq mile) territory you go, there seems to be a dazzling panorama at your disposal. But it is standing atop the spectacular Cesta Tower that will give you the best views. From the gorgeous Old Town clinging to the slopes, your gaze reaches across the fertile soils of Emilia Romagna, the soft rolling hills of the Marche, and on to the placid Adriatic sea. The Sammarinese territory is made up of nine ancient citadels, including the capital, San Marino. What the tiny city state lacks in size, it makes up for in history, museums and priceless architectural monuments. Meanwhile, a wealth of assorted crafts and souvenirs provide a vast, pleasant shopping experience. The free movement between San Marino and Italy, not to mention the fact that most locals support the Italian national team in football tournaments, might lead you to believe the territory’s independence lies in name only. But the Sammarinese have their own government and a distinct local culture. Everyone speaks Italian, but the San Marino dialect has failed to die out, while unique dishes such as white rabbit stew, black risotto and Cacciatello cake are local treasures. As well as imbibing the local food, other pleasant diversions include getting a colourful stamp in your passport at the State Post Office, visiting the impressive Three Towers of San Marino and the lavish Parliament Building. 61.2 sq km (23.6 sq miles). Two Capitani Regenti are elected every six months. Nicola Selva and Michele Muratori since April 2019. Secretary of State for Foreign and Political Affairs Pasquale Valentini since 2012. Although there’s no recent history of terrorism in San Marino, attacks can’t be ruled out. The European Health Insurance Card (EHIC) is not valid in San Marino. Around 6,000 British nationals visit San Marino every year. Most visits are trouble-free. The emergency services numbers in San Marino are: 112/113 (emergency service, gendarmerie), 115 (public safety, fire department, local police), 118 (emergency ambulance and medical services). Consular support is not available from the British government in San Marino. However, the British Embassy in Rome, Italy can provide consular support to British nationals. Street crime is extremely rare. However, you should take the usual precautions with passports and money. Drinks served in bars overseas are often stronger than those in the UK. Do not accept drinks from strangers or leave drinks unattended. To drive in San Marino you must have a valid UK driving licence. Driving is on the right-hand side of the road. It’s a legal requirement for motorists to carry one red warning triangle to be placed, in the event of an accident or breakdown, behind the vehicle. You should also carry a certificate of car insurance. At the time of entering the country, car insurance must be valid for more than three months. San Marino has similar drink driving laws to Italy. The legal limit is 0.05%, also defined as 0.5 grams of alcohol per litre of blood (50 mg/100 ml of blood). San Marino has laws requiring small children to be in an approved child safety seat. It’s illegal to use a mobile phone while driving. You can talk with a completely hands-free unit. Smoking while driving is also prohibited. The speed limit is 50 km per hour in built up areas,110 km per hour on dual carriageways and 130 km per hour on motorways. See the RAC and AA guides on driving in San Marino. Although there’s no recent history of terrorism in San Marino, attacks can’t be ruled out. You should be aware of the global risk of indiscriminate terrorist attacks, which could be in public areas, including those visited by foreigners. San Marino has strict rules on public drunkenness and applies a zero tolerance policy towards the possession and use of illegal drugs. 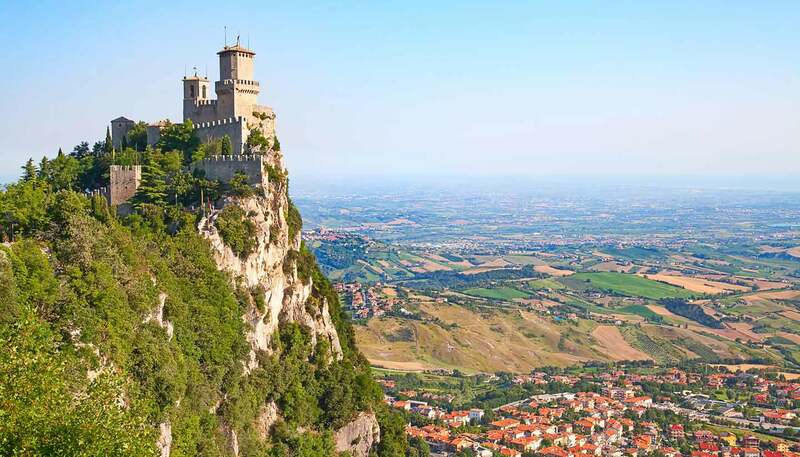 You don’t need a visa to visit San Marino. If you’re staying in San Marino for less than 30 days in an official residency (ie hotel or bed and breakfast) you don’t need a ‘permesso di soggiorno turistico’. However, if you’re staying privately, you’ll need to report your stay to the Ufficio Stranieri (Foreigners’ Office) of the local Gendarmerie within 24 hours of arrival. If you’re staying for work you must apply for a ‘permesso per motivi di lavoro’ (a work permit), which is issued for some categories of workers only. More information about permits is available on the San Marino website. UK Emergency Travel Documents are accepted for entry and exit from San Marino. Although San Marino is not a member of the European Union the local currency is the Euro.